Weeks full of "plane" fun. Eagle Aviation Camps offer children entering the 3rd through 11th grade a week-long experience in flight! Our camps focus on the science, history, engineering and careers of aviation. Camps are age-appropriate and include in-depth explorations, hands-on builds and activities, science experiments, field trips, programs, presentations, behind the scene tours and much more! The museum is in the process of finalizing an online registration form that will go live in late April. Since many of you have expressed an interest in our camps and the desire to make summer plans now, we have decided to offer a one-day pre-registration event. For those who are interested in signing up on this day, you must come to the museum and complete your registration form and pay for the camp(s) of your choice. Click here for the 2019 Eagle Aviation Camp registration form. **Please note spaces are limited, first come first serve, and we will not be able to take phone or online registrations on pre-registration day. $350/ $325 Museum member Eagle Aviation campers explore the fascinating science of flight and get exclusive behind-the-scenes access to uncover the intricate world of the airline industry. Our youngest campers discover the science of flight through hands-on experimentations, fun engineering challenges, field trips, and the creative use of technology. From building a flying “whatchamacallit”, to predicting the weather, this camp is the perfect introduction to the amazing world of flight! $350/ $325 Museum member Eagle Aviation campers explore the fascinating science of flight and get exclusive behind-the-scenes access to uncover the intricate world of the airline industry. Campers get HANDS ON with workshops on flight engineering, flight simulations, rocketry, remote control planes (to only name a few) and will participate in field trips where they will see and experience some real-world applications. From building their own weather center, to experimenting with different types of energy and creating their own robot, this camp is the perfect launching pad for aviation enthusiasts! $350/ $325 Museum member Eagle Aviation campers explore the fascinating science of flight and get exclusive behind-the-scenes access to uncover the intricate world of the airline industry. This camp will dive deeper into aviation and its “best kept secrets”. Campers will participate in workshops on flight engineering, flight planning, beginner and advanced flight simulations, airliner operations and more! From building a hydraulic lift to creating a brand and conducting a marketing campaign, campers will discover if they have what it takes to run an airline. Are you up for the challenge? $350/ $325 Museum member Eagle Aviation campers explore the fascinating science of flight and get exclusive behind-the-scenes access to uncover the intricate world of the airline industry. With this camp, sky isn’t the limit, it’s only the beginning! From pilots to flight attendants, from engineers to IT specialists, from graphic designers to chefs, career opportunities in the aviation field are almost endless! 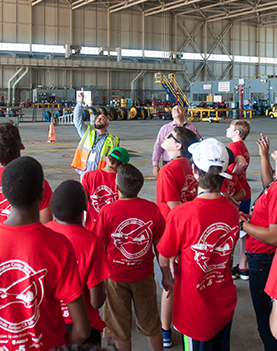 In addition to participating in field trips and hands-on flight simulations and engineering workshops, campers will learn first-hand from aviation professionals about some of the careers involved in airline operations and will acquire some “real-world skills” training that will last them a lifetime. This camp is the perfect segue into the next chapter of their life and will surely ignite passions and dreams of flight! Each camp will be limited to 20 participants. Camps must have at least 14 registrations to be held. No prior camp attendance or aviation knowledge is required to attend any of our summer camps. Camp begins at 9am and ends at 4pm. The Museum offers extended hours from 8am to 9am and from 4pm to 5pm, for an additional fee. Parents/students are responsible for transportation each day to and from the CR Smith Museum. The Museum will provide transportation to and from field trip sites as applicable. The Museum will provide morning and afternoon snacks and bottled water. Campers will be responsible for bringing their own lunch. Registration includes an Eagle Aviation T-shirt and goodie bag. A Cancellation Fee of $50 applies for cancellations before 4/27/2019 and $100 thereafter. No refunds will be issued for cancellations 7 days or less prior to the beginning of registered camp.